Bus trip from La Paz to Arica in Chile. A church made of steel. Digression regarding the Iraq war. The copper mine of Chuquicamata. 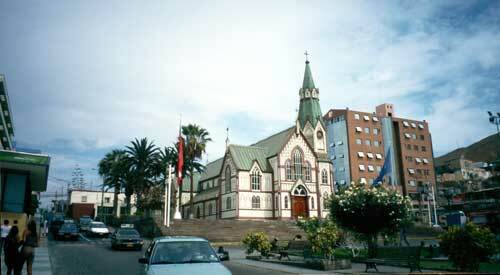 After arriving in La Paz I bought my ticket to Chile for the next morning. In the evening it got a bit stressful as a bag I had ordered to tailor for me was not ready, they had not even started. But finally I got it and after some hours of unsteady sleep I got up by five, was at the terminal by six and by seven on my way to Chile . The bus went through the giant Parque National Lauca to Arica , the most northern city of Chile and an important port for the minerals, ores and metals produced in Chile . The landscape was extreme harsh but beautifully harsh. I had thought to get off the bus in Putre, a little town between the border and Arica to visit the park but as I noticed the distances in the park are huge and worse I had seen snow next to the road … a definitive No as I longed to spend some time in a warm place or at least a not cold place. The last part of the journey went through strangest sand/mountain-landscapes, the most northern parts of Atacama Desert , the driest desert of the world. You have to knock at the walls to believe that this church was made of steel. As there isn’t a lot to see in Arica I immediately bought a ticket for the night bus to Calama and used the remaining hours to so see a little church designed by Eiffel and made entirely of steel (you have to knock at the building to tell) and ate, after a long year the first time, ceviche. Ceviche is a dish made from raw fish that is fermented / "cooked" by adding lemon juice with tomatoes, peppers and some spices. Very delicious! I will try to find a good recipe and test it, the results will be published here in the online version. Did I mention that I left Latin America ? Like Argentina Chile is more European. As soon as I entered the night bus I knew why the different companies have quite different prices. I luckily had chosen to pay a little more and had a lot of room for my legs and a very comfy chair. I even had two seats for me … heaven on earth, I really needed some sleep. The only thing a little negative was that we had to get up two times the night as there are lots of police controls where the entire luggage is searched for drugs. On the border to Bolivia they even had X-rays like at airports. Of course they use the opportunity to also control the transport of agricultural products to prevent the migration of varmints and animal diseases. A word about the war (as it is not a "strike" as CNN calls it): It is quite hard to get information here though it is the no 1 topic in the media. I try to use the scarce possibilities to see CNN and read some news on the internet, but I miss decent news. It is good to hear that people protest worldwide. It is frightening that the self appointed protector of freedom does not hesitate to break UN-law. Of course they always did, e. g. in Latin America., but never that public. Comparing the weapons it is easy to tell whether Bush or Hussein is the more dangerous person. Interesting to read that only hours after they started they inform the public that the conflict will last longer than expected. Truck race – there are even bigger ones than the one in the picture above. Regard the small car in the dust cloud – that’s a big jeep. But back to my trip. At sunrise the bus stopped a few kilometres before Calama to serve some coffee. A sunrise in the desert, wow. In front of use we saw the road to Chuquicamata, the world’s biggest open copper mine, the biggest manmade hole. The endless row of buses, carrying the 11’000 workers (or to be more exact a third of them as they work in three shifts 24 hours, seven days a week) gave me a first impression of the mines dimension. 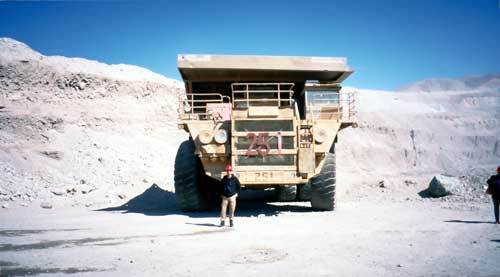 Visiting the mine was the main reason to spend a few hours in Calama. 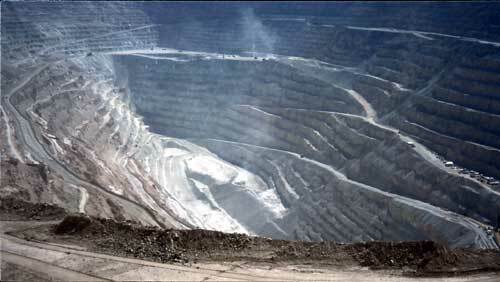 The mine is 4.5km long, 3km wide and 855m deep. They have been mining here for 80 years which is phenomenal as copper mines normally last only some 30 years and they think that they will be able to mine here some 40 years more. 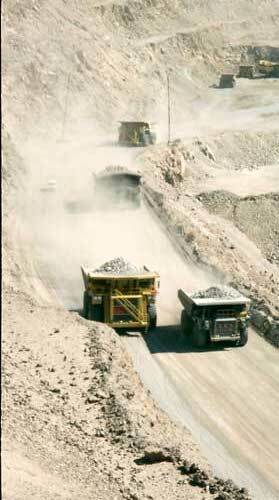 Each day they mine 60,000 tons of ore, the lorries are eight meters wide and the tires four meters high. You can’t see how huge they are until you see a jeep drive next to them. The tires last only five to eight months and cost 15 to 25 THOUSAND dollars, each one of them. There is no way to have them recycled, there is no machine big enough to do it. So they use them as barriers all over the mine. And also the trucks are expensive, they cost some 2.7 million dollars each and last ten to fifteen years. Each of them carries up to 360 tons and for the way up out of the mine they need three hours. Half of the material mined is useless and they mine it to maintain the geological equilibrium as the ore is directly on a geological folding. As the trucks need two litres of diesel each minute they don’t take it a long way and form artificial hills with it. They will soon also cover the city Chuquicamata, the inhabitants are moved to Calama. Reducing costs is only one reason as the mining cooperation tries to get an ISO certification which does not allow that people live next to a quite toxic industrial plant (though they do their best to reduce contamination). Ladies: I heard different things about the local men. Some of the female tourists said that they were quite attractive to and very masculine but more often I heard comments like "not attractive" or "too small". So you have to decide for yourself and if you don’t like the men there is sufficient very beautiful landscape.